Max Landis failed to impress critics and the box office with “American Ultra” a vaguely similar action/adventure, romantic comedy about an offbeat, near-superhuman agent capable of killing vast amounts of people in increasingly creative ways while hoping to woo an equally offbeat girl who might just be the key to keeping him from going completely insane. While “American Ultra” at least offered some humor and barely held onto a dreamlike sense of reality (as unlikely as any of the events might have been), "Mr. Right" let's go of reality within it's first few scenes. With this film Max Landis has taken this familiar concept completely off the deep end. 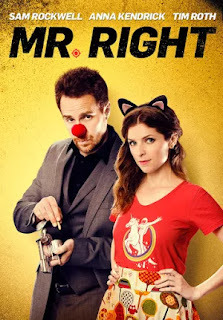 He and director Paco Cabezas task charismatic actors Sam Rockwell and Anna Kendrick with carrying a film that is so lacking in any sense of logic, so full of cliches, and with such a lackluster story that it scarcely presents any compelling reason to exist at all. On top of that they’re given characters so bizarre and illogical they don’t resemble real people in any way. It also borrows from “Guardians of the Galaxy” in that the oddball leading man has a tendency to breakout into random solo dance parties whenever Norman Greenbaum’s “Spirit in the Sky” comes over the soundtrack (though here Francis doesn’t put on headphones so he’s essentially dancing to nothing). He has also formed his own bizarre form of dance fighting that feels even more strange when a random bad guy (who Francis eventually befriends) fights in a similar dancy fashion. Anna Kendrick, on the other hand, is required to speak quickly and try noticeably hard for both slapstick humor and quirky conversation. As good as she might normally be, even she can’t pull this stuff off. One moment she’s the sympathetic “normal” character we identify with, the next she’s doing things and saying things that sound like they were written for some unpublished Harley Quinn origin comic. The story involves two subplots crammed together in boringly cliche ways. The first of the subplots finds retired CIA agent turned hitman, Francis (Sam Rockwell), falling for quirky girl Martha (Anna Kendrick), who is brokenhearted after breaking up with her cheating boyfriend. They meet at a convenience store where he immediately asks her out, and despite her better judgement and his creepy looks and demeanor, she goes along with him. She takes his admissions of murder as jokes and genuinely seems surprised when everything he tells her turns out to be true. But yet again, when most people would run away and call the police, she sticks it out for no reason. Francis may be a murderer for hire, but he’s having a change of heart and trying to stick to a new moral code. Rather than killing the person he’s been hired to kill, he kills the person who hired him in the first place because killing is wrong. That should give you a bit of an idea the sort of person he is. Yet as crazy as he seems, there is a turning point in which Martha turns full blown psychopath. The second subplot involves an ill-defined squabble between brothers involved in a family run criminal organization. The younger brother hires Francis in his older brother’s name knowing full well that Francis would likely target the older brother. That’s the sort of bizarre, nonsensical, roundabout methods the characters in this film tend to take. No one involved in this film bothered to ask why the younger brother didn’t just kill the older brother and be done with it. Nor do they bother asking how Francis would ever get hired again if it were known that he killed the people who hired him. Nevertheless, having Francis involved in this family squabble, of course, puts Martha in danger, and thus the film’s climax can involve an over-the-top shootout in which none of the characters feel particularly compelled to do battle with one another. This scene is so unconvincingly setup that it's laughable. One shootout scene leaves Francis wounded and unarmed. Instead of just killing him and Martha, they leave him where he is and kidnap her only to await in fear his eventual return to their hideout. It's such an illogical set of events that I began to suspect the whole film was made so that the makers could say "gotcha" to whoever paid to see it. If the bizarre characters and lackluster, nonsensical story weren’t bad enough, director Paco Cabezas also fails to entertain with competent action sequences. He simply doesn’t know how to stage an interesting sequence. When he isn’t ending the action too quickly in very anticlimactic ways, he relies on cheap tricks we’ve seen hundreds of times over (like the slow motion bullet leaving a gun barrel and eventually finding a skull across the room). While the film is in romantic comedy mode, Rockwell and Kendrick manage to build chemistry despite the weird things they’re forced to say and do. But that leads me to what is likely the worst scene in the film. It involves Francis introducing Martha to his weirdo philosophy that sounds vaguely like George Lucas’ “Force.” He and Martha wave their hands around in rhythmic motion for a moment before the scene devolves into a game of catch with knives. I’ve seen quite a few movies and put up with a lot of bad ones, but I very nearly had to walk away from this one during this scene. Max Landis took to Twitter to voice his anger at the poor critical reception and lackluster box office returns for 2015’s “American Ultra.” He posited that people complain about the lack of originality in today’s Hollywood, but then crush his work even when it is an original idea. Here he went the complete opposite direction. It’s no wonder this film only got a limited theatrical plus digital rental release. It’s not original, and it’s completely bonkers in the worst ways possible.